Today known as the home to the Crown Jewels of the British Monarchy – in particular, the world-famous Koh-i-noor, the Tower of London has a darker and bloodier past. Cutting across 12 acres, this castle houses the main White Tower with two concentric layers of defence walls surrounded by an outer moat. Designated as a UNESCO World Heritage Site, over its 1,000-odd-year-old history, the site has served in various capacities ranging from an armoury to the Royal Mint. 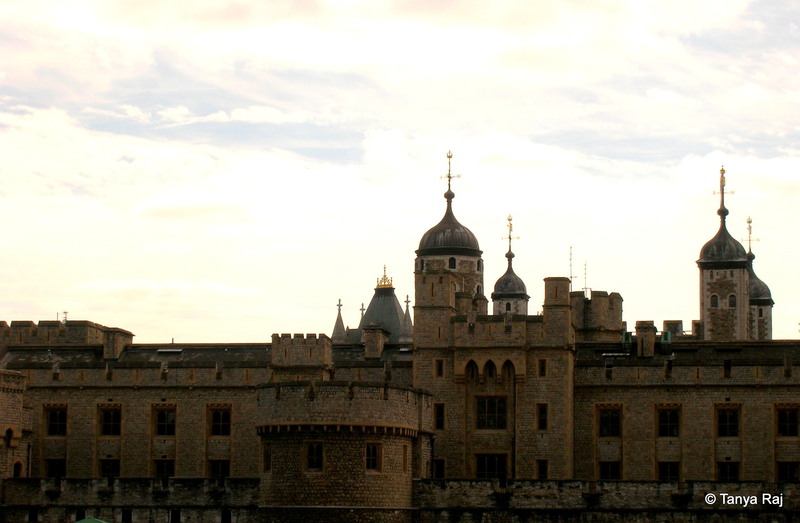 Tower of London – home to the Crown Jewels – as seen from across the road near the Tower Hill tube station. Motifs at the entrance arch. 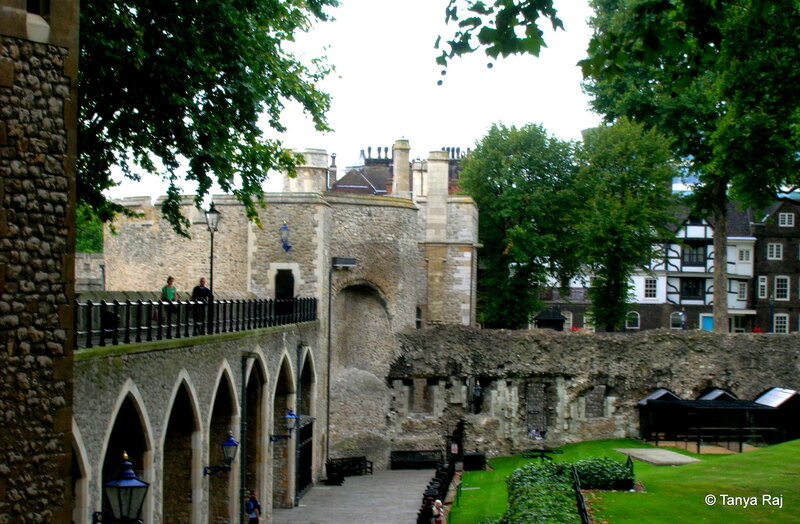 However, it has been most notorious for the 112 executions that took place in its northern Tower Hill which include the Princes in the Tower and numerous Dukes and Earls over a period of 400 years. It is said that the ghosts of many of those executed in these premises still haunt its grounds. The outer layer of defence wall. 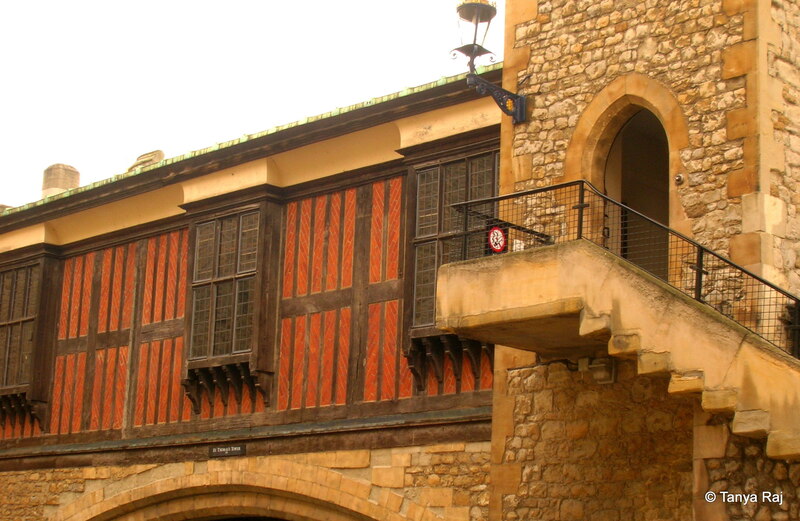 The castle, along with displaying the crown jewels, also serves as a museum, mostly of gory torture devices that were used in the mediaeval times. On display were equipment to crush the bones and stretch the limbs, all in the name of getting a confession from the prisoners. However, the royal prisoners, of which the castle was home to many, there were areas that provided decent living quarters. 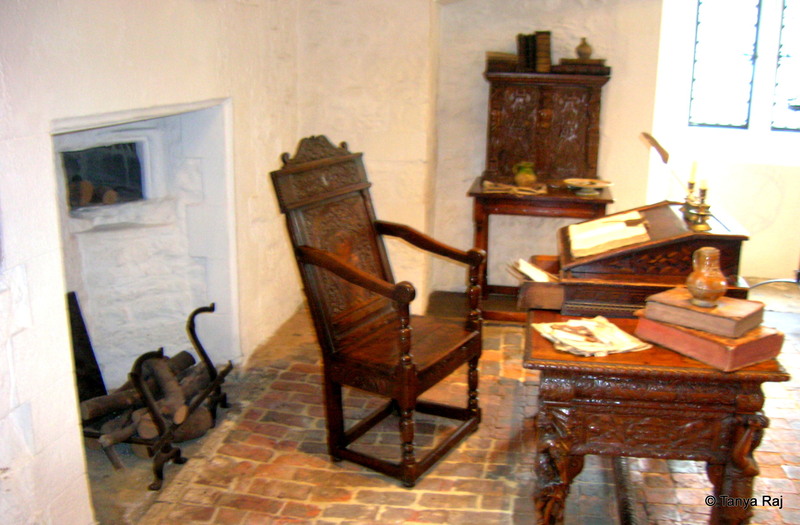 A section showcased furniture and room setup from the era of how a study would have looked like in those bleak days. A section of the prison where prisoners were allowed a private study. 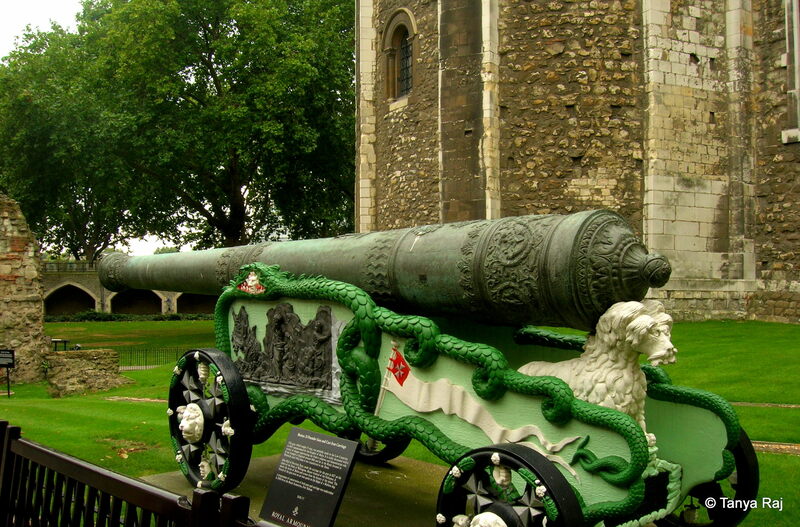 A cannon on display at the outer grounds. The outer hall of the museum also put together a display of war armour, cannonballs of various shapes and sizes, and hand operated massive swivel guns – all behind neat glass cases. Further down the hall, after a small turn is the St John’s Chapel, a small cellar styled place of worship, with stone columns surrounding the small rows of pews. Behind the columns, small windows covered in stained glass paintings, hardly let any light in. 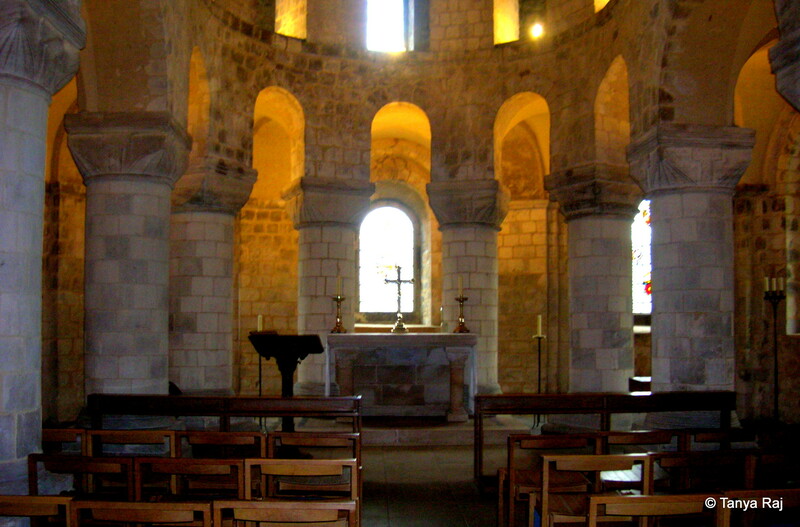 St John’s Chapel – a small cellar styled place of worship within the castle. 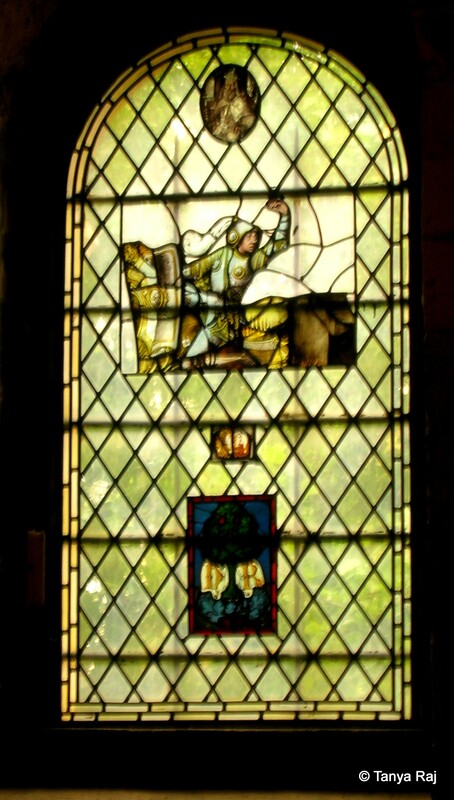 Glass paintings as seen from inside the chapel. After exploring the castle inside, I step out to the grounds and see a beefeater – the official guards of the Tower – talking to a small group of people about the Royal Ravens. He mentions, “There are always six ravens on the Tower grounds and to prevent them from flying away, their wings are clipped.” Legend has it that King Charles the 2nd was told by a soothsayer that if ever the Ravens were to leave the Tower of London, the Crown and along with it, Britain, will fall – and so the tradition continues till date. Few of the Royal Ravens, who according to legend never leave the castle grounds. Outside on the grounds, near the Traitors Gate, a group of theatre artists are putting up a street play on the Tudors – the era that has left the most mark on this historic landmark, as it was under them that the castle stopped being used as the royal residence. 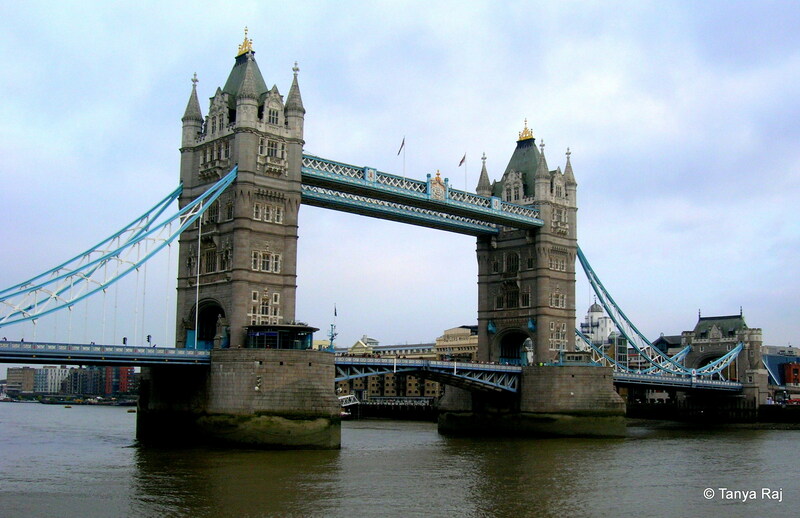 After a final stroll of the grounds around the residences of the beefeaters – yes, the guards stay within the compound – I exit towards the Tower Bridge, which is most commonly mistaken as London Bridge. 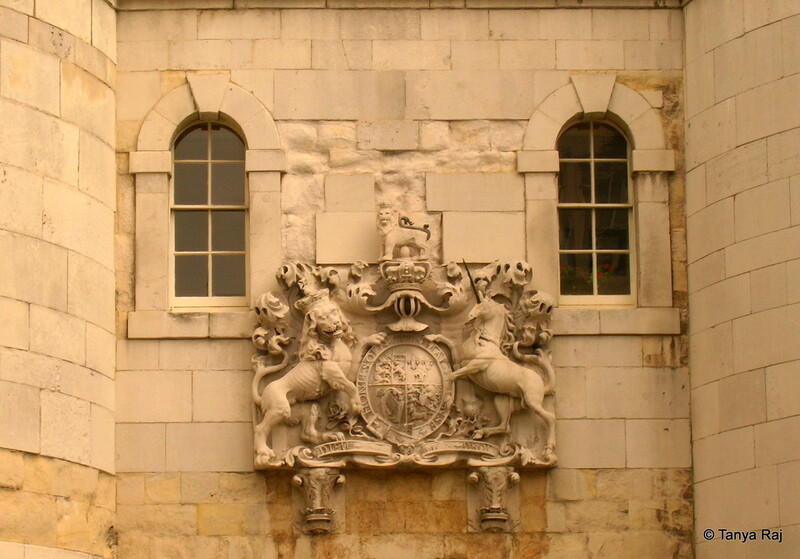 The section above the Traitor’s Gate, which was used to bring the prisoners inside the castle via the Thames. 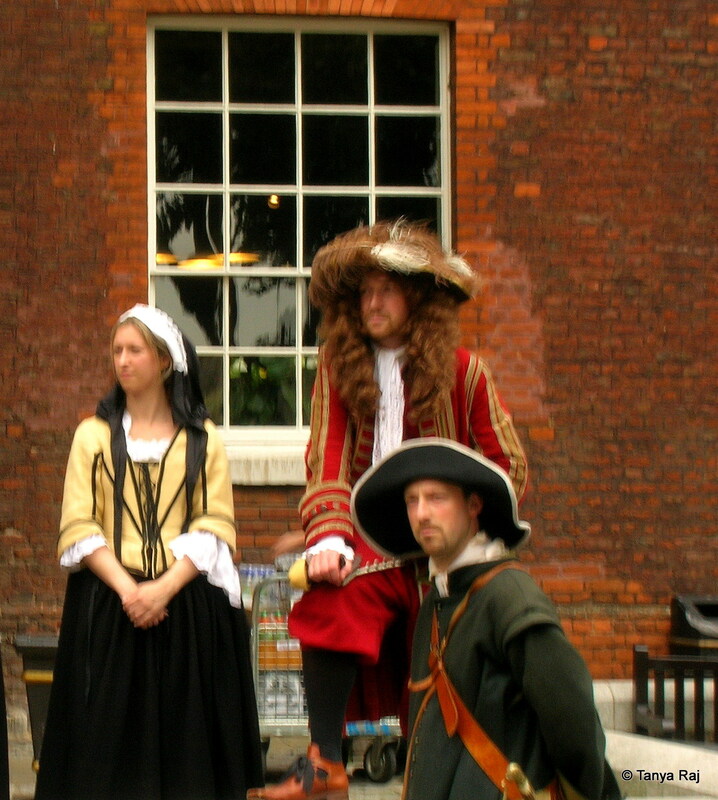 Artists acting a street play on the Tudors. 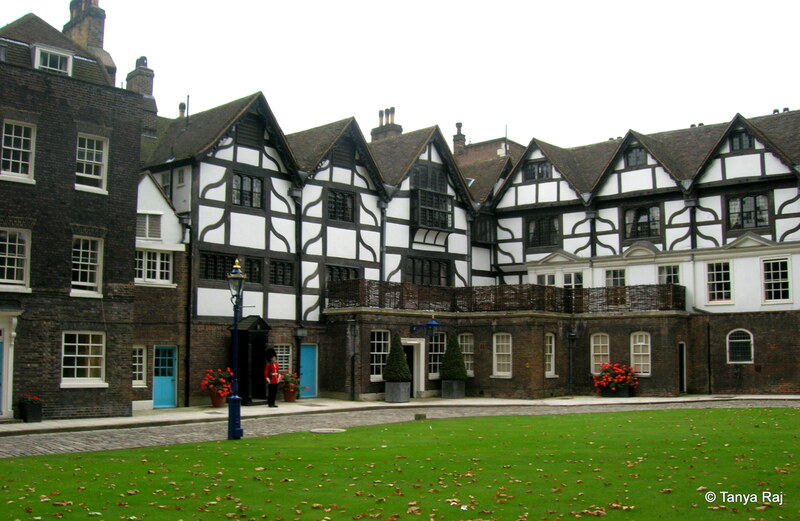 Residences of the beefeaters – the guards who stay within the compound – and even have a small pub to themselves! 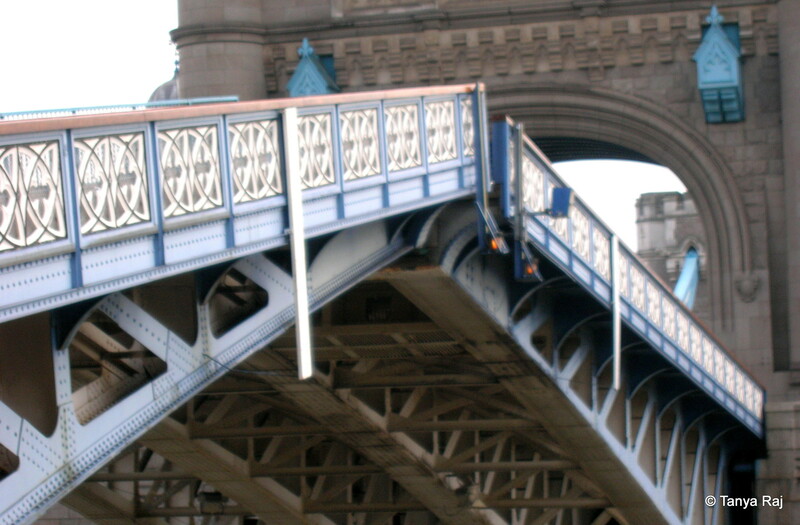 Standing under one the bridge’s towers and admiring the river ahead of me, I notice that the traffic from both sides are starting to halt and I hear a grinding noise coming from underneath. I see the bridge start to lift to make way for an oncoming shipping vessel. The whole lift takes about 10-12 mins and once the ship passes, the bridge goes back to its place. In between clicking the pictures and being awestruck, I am told by my friend that this does not happen very often, so clearly, I am counting this to be my luck. 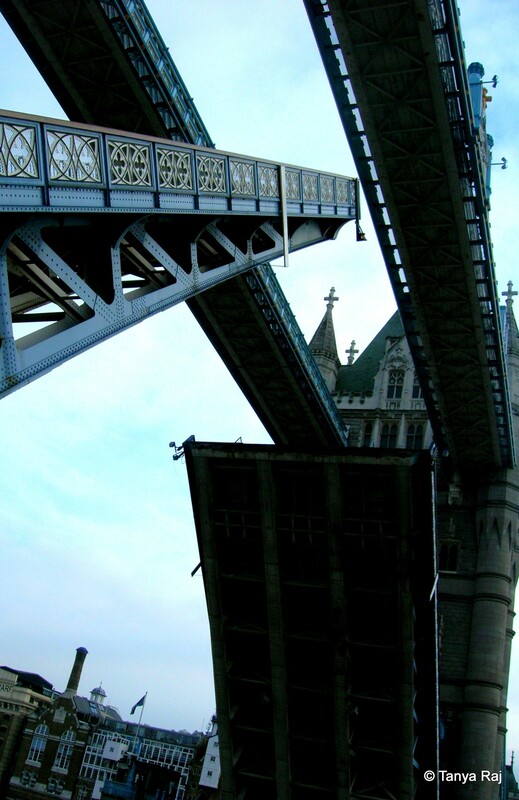 The Tower Bridge as seen from the back exit of Tower of London. The bridge starts to lift, to make way for an oncoming shipping vessel. And the lift is complete!